The former chief US weapons inspector has questioned the abilities of the intelligence services after failing to find illicit arms in Iraq. David Kay said in a US radio interview that he thought the CIA owed the president an explanation for warnings about the threat Iraq posed. 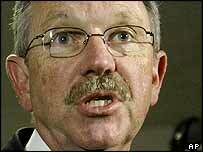 Dr Kay resigned on Friday saying he did not believe Iraq possessed large chemical or biological stockpiles. The White House continues to assert that such weapons will be found. As questions continue about Iraq's weapons of mass destruction as a cause of war, UK Foreign Secretary Jack Straw said it was "disappointing" none had been found, but insisted the war was justified to liberate Iraq from a "terrible tyrant". Dr Kay began efforts to find Iraq's alleged WMD when he was appointed by the CIA to lead the Iraq Survey Group (ISG) last June. He said at the time that weapons would be found. The issue of banned weapons was the central element of the US case for invading the country. Dr Kay said the intelligence agencies had failed to find that Iraq's weapons programmes had been in disarray in the last few years, and that major chemical and biological weapons production had virtually ceased after the first Gulf War in 1991. He also said Syria had yet to explain the "ample evidence" that it may have accepted the transfer of WMD onto its territory before the war. "There's satellite photography, there are reports on the ground, of a constant stream of trucks, cars, rail traffic across the border. We simply don't know what was moved." On Sunday, Damascus said allegations that Iraqi weapons were moved to Syria were "baseless". In another interview for the New York Times, Dr Kay said that in the late 1990s Iraqi scientists had begun presenting ambitious and fictitious weapons programmes to Saddam Hussein as a means of obtaining cash for corrupt money-raising schemes. "The whole thing shifted from directed programmes to a corrupted process," he said. "The regime was no longer in control - it was like a death spiral. Saddam was self-directing projects that were not vetted by anyone else. The scientists were able to fake programmes." Dr Kay said the failure to recognise this had led him to recommend an overhaul of intelligence-gathering and analytical efforts by the CIA and other agencies. "I have had analysts apologising for the conclusions that they did," he said. An intelligence official said in response that it was premature to say that intelligence was completely or even largely wrong, and that "a lot of answers" were still needed.